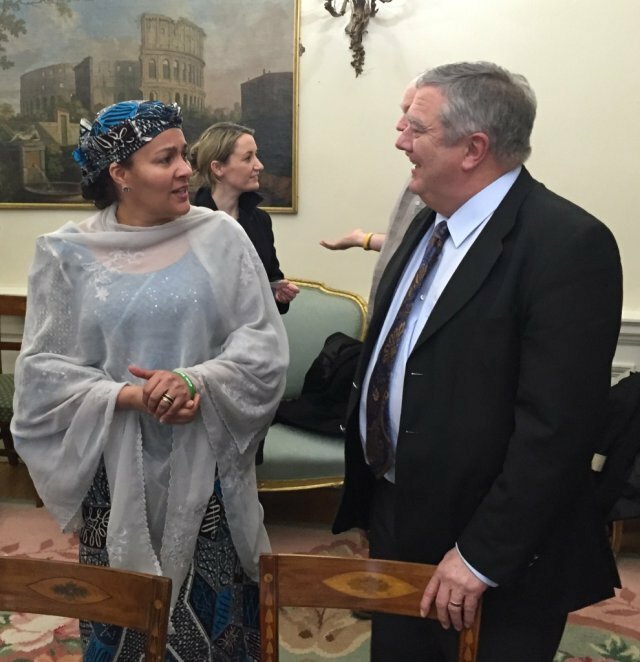 Michael Kiely, CEO of ChildFund Ireland was one of a select number of guests invited to meet Amina Mohammed, Special Advisor to the UN Sec Gen on Development Planning Post-2015, at an important gathering in the Department of Foreign Affairs, Dublin. The Special Advisor was in town last Thursday (15th) to meet with NGO’s as part of this years vitally important discussions on the post-2015 development agenda. In her powerful opening address Ms Amina Mohammed singled out ChildFund as one of two organisations in particular that have made serious contributions to date, and she called on Civil Society and NGO’s alike to keep pushing the post-2015 agenda. After the formalities had concluded, Mr Kiely had the pleasure of speaking to Ms Amina Mohammed about ChildFund’s Free from Violence & Exploitation campaign, and our tireless efforts to raise awareness of child protection, marking it as a potential priority goal in the post-2015 debate. In December 2014, Ms Amina Mohammed was presented with a framed certificate in New York, representing the almost 300,000 signatures that ChildFund has amassed worldwide in support of our ‘Free‘ campaign, which hangs proudly in her office. Earlier in the day Ms Amina Mohammed enjoyed a convivial lunch with President Michael D Higgins at Aras an Uachtarain. ChildFund was delighted to use this opportunity to again press our concerns on child protection. We sincerely hope that Ms Amina Mohammed found her visit to be both productive and enjoyable, as we all look ahead to an important year of discussion, debate and decision-making, during which we hope that the voices of vulnerable children will be given the platform they deserve.